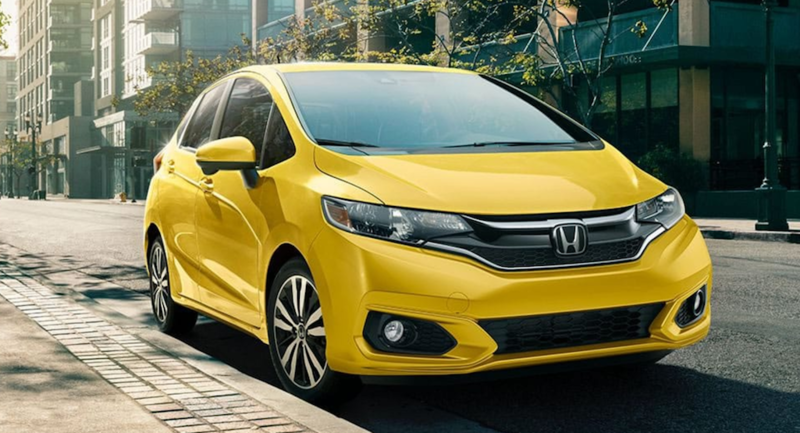 The 2018 Honda Fit is small in size, but big in attitude! Evesham Township shoppers will have an impressive combination of power and efficiency behind the wheel of the 2018 Honda Fit. The Fit features an available Eco Assist system that displays fuel efficiency information for the driver. The system monitors and displays the impact of your driving style on the vehicle’s overall efficiency and uses coaching bars so that you can more efficient driving habits. Beneath the hood, and engine powered with EarthDreams® Technology helps to take that performance and efficiency a step further. For the new model year, the 2018 Honda Fit, available at Burns Honda, has been completely redesigned. The exterior features an aggressive front bumper, new headlight housing, and fog lights that come together to make a sporty impression. Though it looks compact on the outside, there’s over 93 cu-ft of passenger space on the inside and up to 52 cu-ft of cargo capacity, thanks to its versatile seating options. The second-row Magic Seat® allows the cabin to transform into four modes: Utility, Long, Tall, and Refresh. Utility Mode allows for up to 52 cu-ft of space to fit a bike or even a small couch. Long Mode is perfect when transporting longer items, like ladders and surfboards. Tall Mode creates up to four-feet of vertical space to fit taller cargo items. Refresh Mode folds the front seats back and reclines the rear seats so that you can stretch out in comfort. Available heat front seats offers up two heat settings, and keep you warm when the New Jersey weather isn’t! Shoppers at our Evesham Township Honda dealer will be more connected than ever before, thanks to the 2018 Fit’s 40+ technology features! The available Honda Satellite-Linked Navigation System® features voice recognition and HD traffic to give you turn-by turn directions to almost any address in the US—making it easier for you to get where you’re going! Bluetooth® Streaming Audio, standard on all Fit models, allows you to stream your favorite songs right from your smartphone! Apple CarPlay and Android Auto make it easier to seamlessly connect your compatible smartphone to your vehicle, allowing you access to your favorite apps, podcasts, music, and more—all through the vehicle’s touchscreen. Technology doesn’t stop at connectivity for Evesham Township shoppers. The 2018 Honda Fit offers an array of innovative safety technologies. The available Honda Sensing® suite of technology includes a number of driver-assistive features, like the Collision Mitigation Braking System, Road Departure Mitigation System, Lane Keeping Assist System, and more. In addition to these available features, the Fit offers a variety of standard features that offer drivers the peace of mind they need behind the wheel. The advanced airbag system includes SmartVent® front side airbags as well as side curtain airbags with a rollover sensor. Other standard features, like the Anti-lock Braking System, Vehicle Stability Assist system, Electronic Brake Distribution system, and more help to keep you and your passengers out of harm’s way. To learn more about the 2018 Honda Fit or to schedule a test drive, contact us at (855) 571-4863.